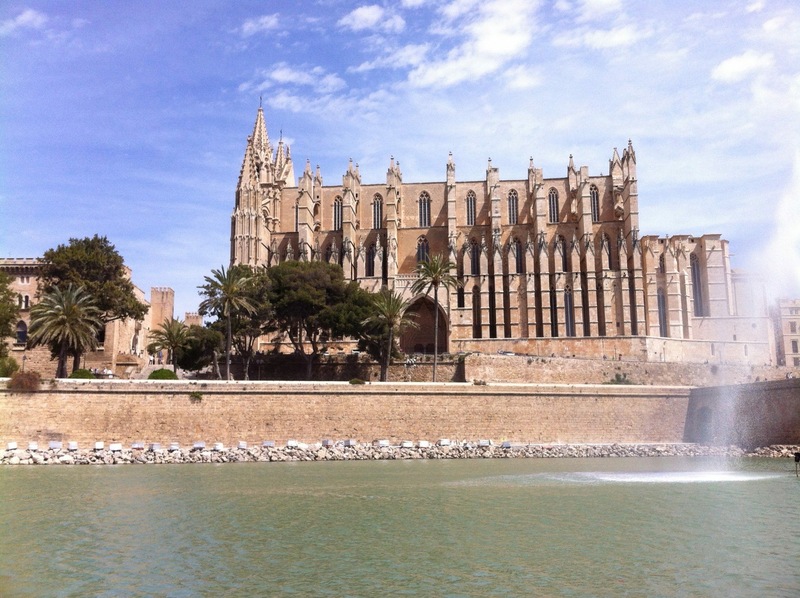 Palma is the capital city of the Spanish island of Majorca, dominated by the honey-coloured stone of Santa María cathedral, which towers over the Badia de Palma (bay of Palma). Next to the cathedral sits the Moorish-style Arab fortress, Almudaina, which is now a royal residence. 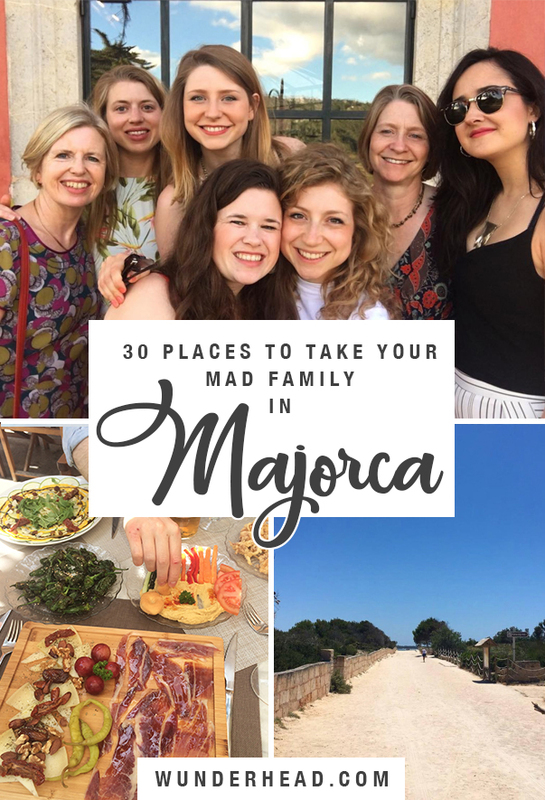 The city itself is perfect for wandering around in the Majorcan sun, ducking into shops and exploring cobbled alleyways. 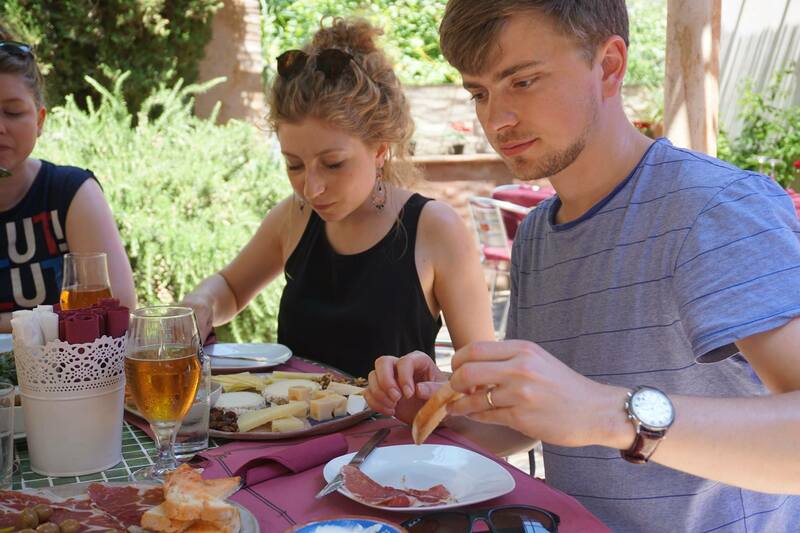 In the four years we’ve visited we’ve never entered Palma with any particular purpose other than to observe the locals and sample the local tapas. Caution: The stone steps around Palma have been polished smooth by millions of passing feet – I experienced this personally in the famous flip flop incident of 2015. Tread carefully! 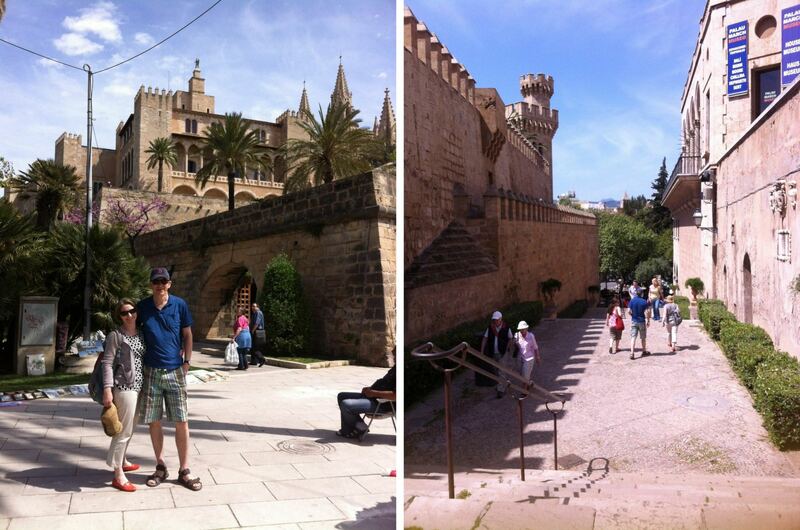 Left: My mum and dad outside the Almudaina fortress. Right: The steps of doom. The Cathedral towers impressively over the Parc de la Mar. 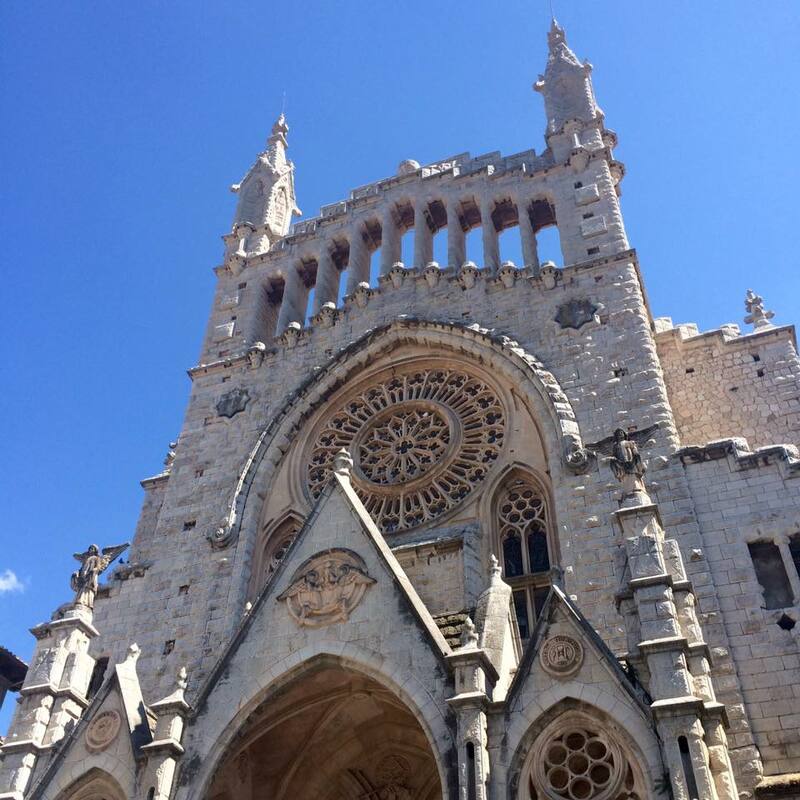 This massive Gothic structure is the most striking feature of Palma, arguably of the whole of Majorca. The building itself seems to be almost impossibly tall, built in the 13th century on ground raised above sea level. With the water spread out in front of it, the cathedral stands tall and unchallenged at the forefront of the city. Heads up, to enter the cathedral you need to be dressed modestly. This means your legs and shoulders must be covered, and hats removed. We stumbled upon this restaurant bar in the square behind Parròquia de Santa Eulàlia when we were hungry for tapas, and ended up enjoying some delicious afternoon cocktails along with it. 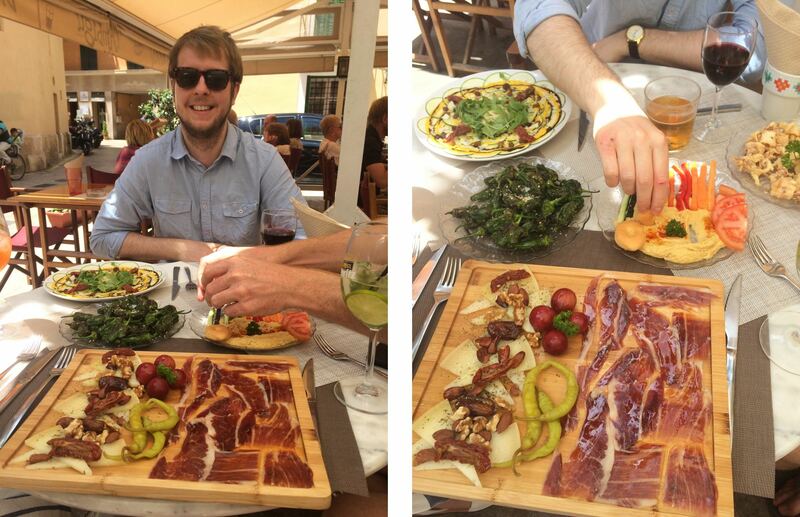 Delicious tapas for lunch in l’ambigú bar, Palma. This laid back cafe nestles amongst the trees along Carrer del Palau Reial, lucky for us we found it right as our (and by “our” I mean “my dad’s”) stomachs were beginning to growl. 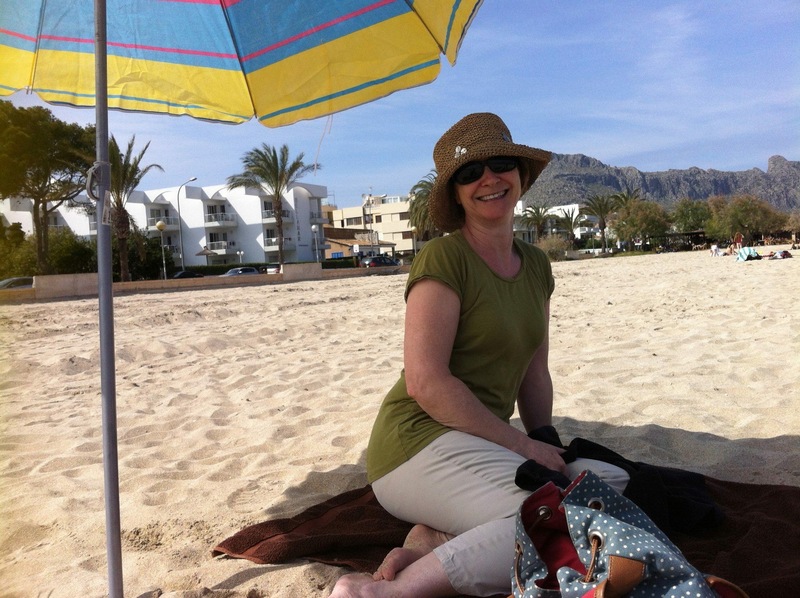 Ca’s Caparrut is a great place to take a break from the sun and enjoy some paella. 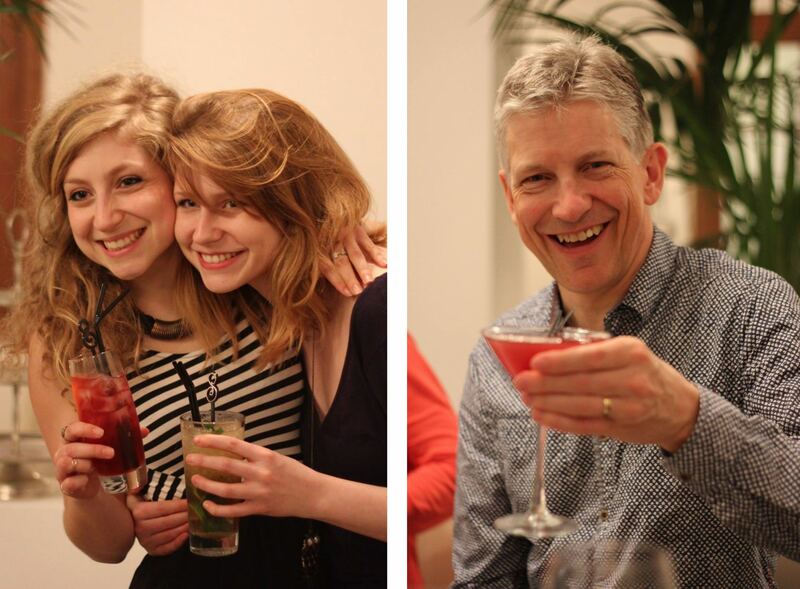 Hannah, dad and mum waiting to be served at Ca’s Caparrut. This beautiful town is cradled in a valley with mountains on every horizon. 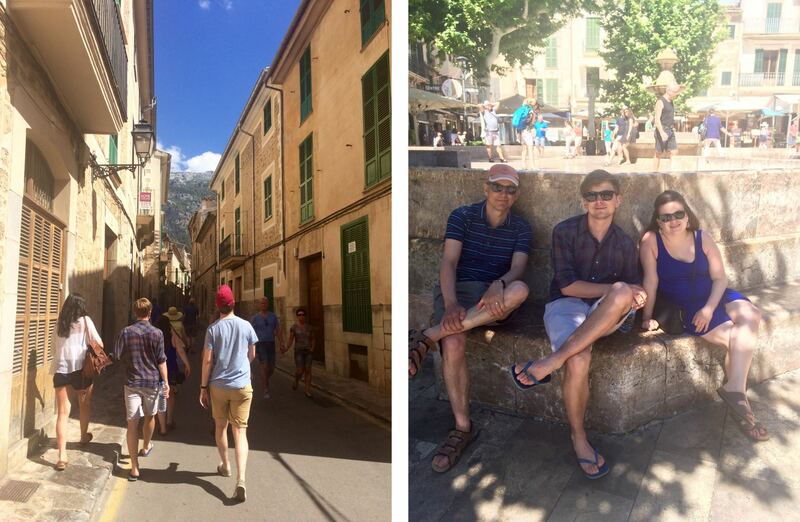 With such stunning scenery the most appropriate past time can only be relaxing outside a cafe in Plaça Constitucio in the centre of Sóller, watching tourists go by and admiring the intricate facade of Església de Sant Bartomeu. The Església de Sant Bartomeu, Sóller. 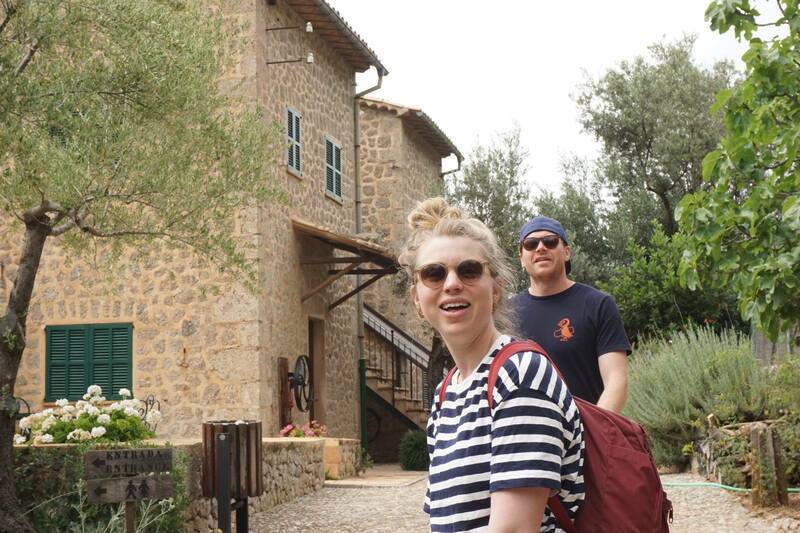 Left: Strolling along the streets of Sóller. 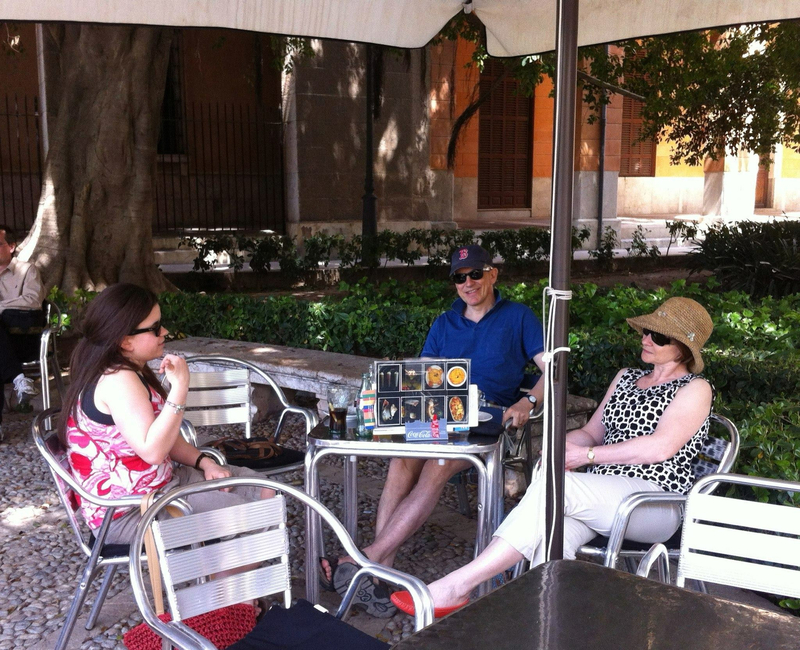 Right: Taking a break in Plaça Constitucio. The tram travels along the pedestrianised seafront to the marina at the north end. The Tranvía de Sóller departs from Plaça d’Espanya, taking a winding route past gardens and houses before arriving right at the beachfront of Port de Sóller. The tram itself is nothing short of historic, serving the town since its construction in 1913, and one of only two first generation tramways in the whole of Spain. 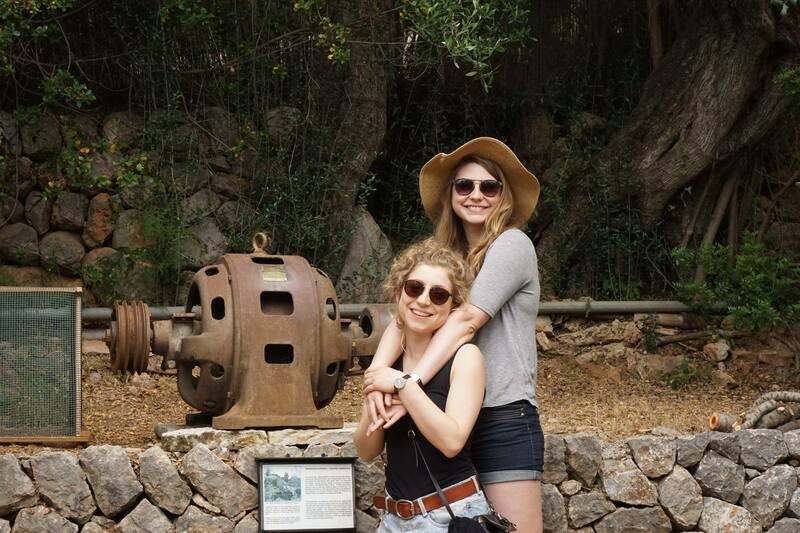 Riding the tram turned out to be a welcome relief from the hot sun, allowing you to sit back in the rickety old wooden seats and admire the orange groves and farms as they trundle by. The line is 4.868 km long, connecting the main town to the coastal village. 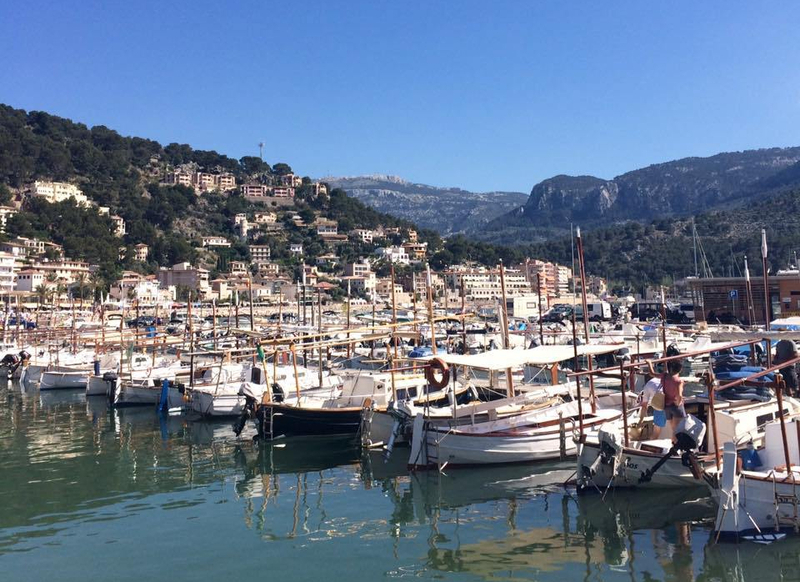 Port de Sóller is a pretty coastal village, with a strip of land shielding the beach from the sea, making the tide quiet and peaceful. Full disclosure, we didn’t spend loads of time here, so the tram was basically our main activity. Boats in harbour in Port de Sóller. Another small village scattered over forested hills of oak and almond trees, Valldemossa is famous for its beauty as inspiration for many creative people throughout history. 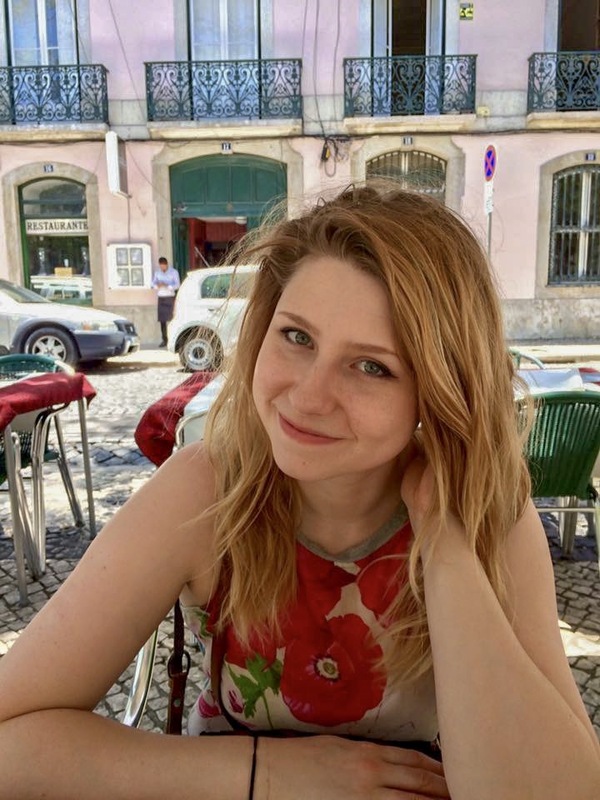 Amongst its famous past inhabitants are philosopher Ramon Llull, composer Frédéric Chopin, writer George Sand, poet Rubén Darío, author Jorge Luis Borges, and composer Joseph Horovitz. 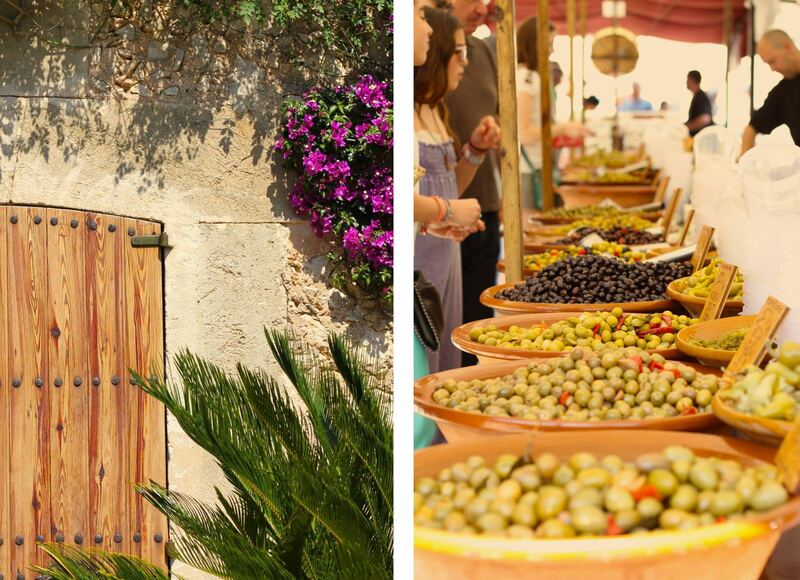 It’s also the birthplace of Catalina Thomas, Mallorca’s patron saint. 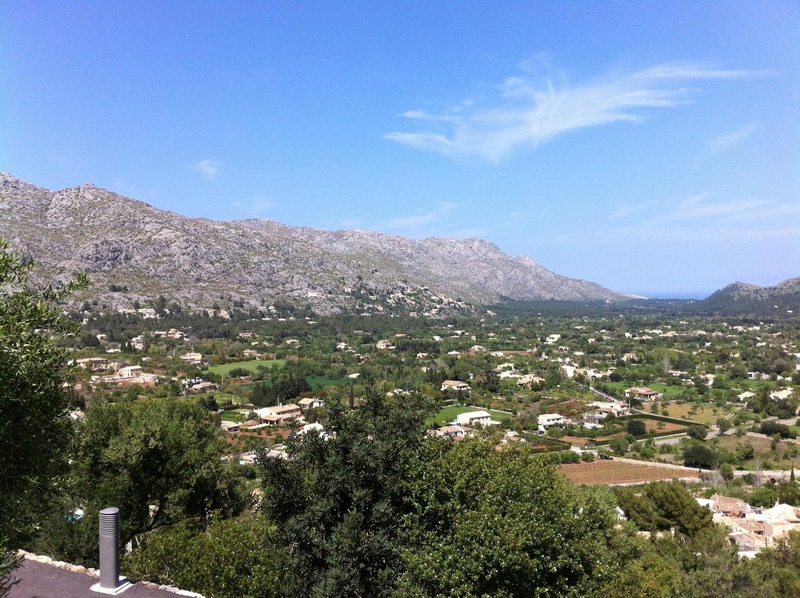 This small village has that unique Majorcan property of being both coastal and mountainous at the same time. 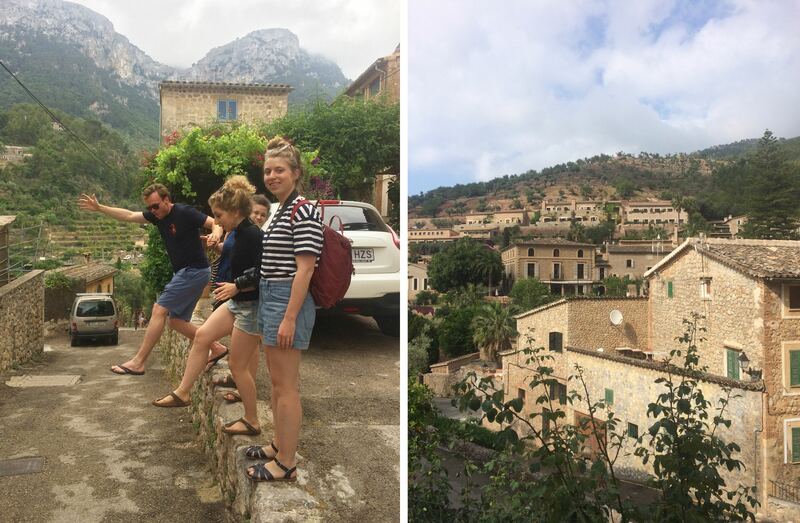 It’s only 16km north of Valldemossa and has a similar creative history, with a stunning landscape of olive and orange groves, teetering on steep cliffs down to the Mediterranean. 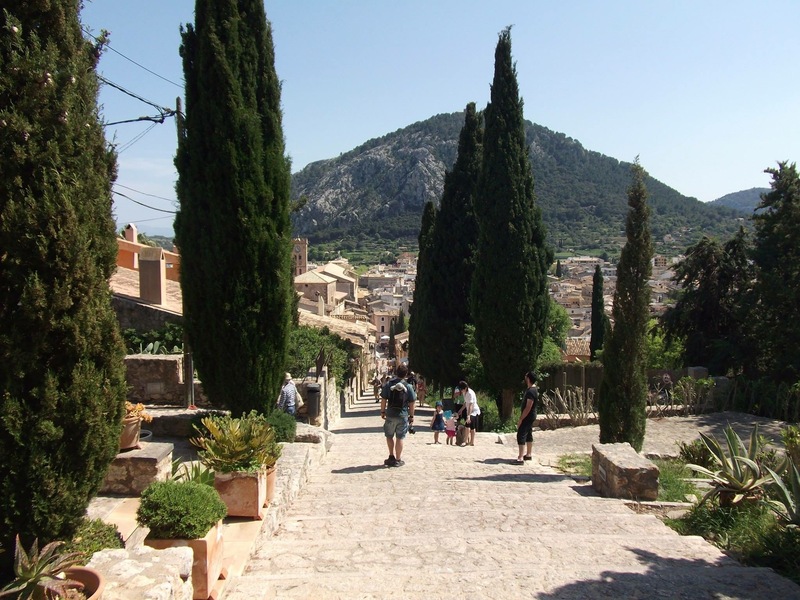 The town of Deià sits in the north western hills of Majorca. The home of English poet, novelist, and scholar Robert Graves is now a museum you can visit, with rooms reconstructed to how he and his wife Laura Riding would have lived, and areas cleared to host manuscripts and historical artefacts, including the Seizin Press they set up together. Graves returned to Majorca after the First World War and lived in Deià until his death in 1985. The town features in many of his stories, none of which I have read, but boy does he have a nice garden. 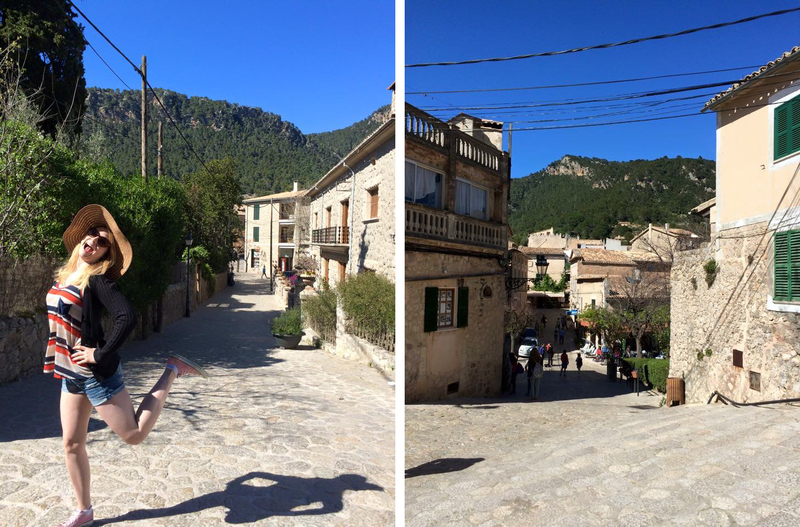 Left: Climbing the steep streets of Deià. Right: Matt and Tom posing behind the church gates. 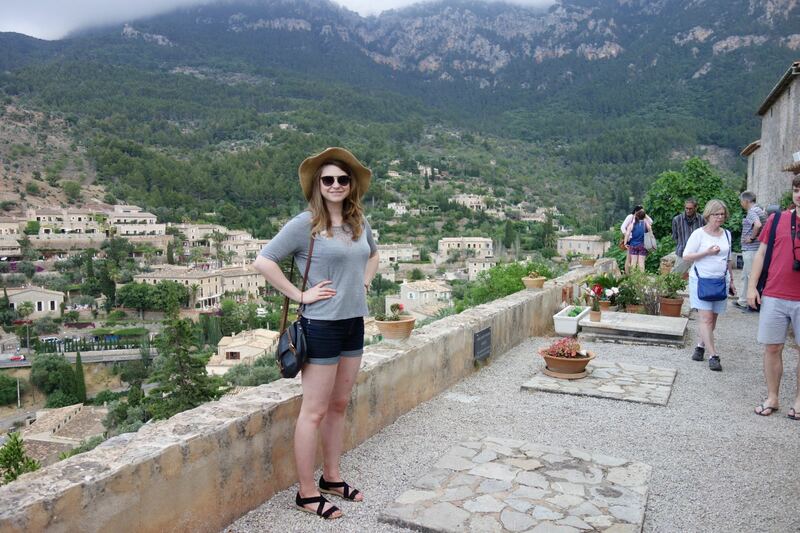 From almost everywhere in Deià you can see the church perched on top of the hill. Climb the steep Carrer Es Puig lined by cypress trees and you’ll come to the beautiful stone building of the Parroquia San Juan Bautista sitting in front of the town cemetery, the resting place of Robert Graves. His grave, like many of the others, is surprisingly simple, with his name written by hand in concrete. The centuries old cemetery looks out over the village of Deià with its the stone houses sprinkled over rolling hills, and out to sea, and is still used by local families to this day. 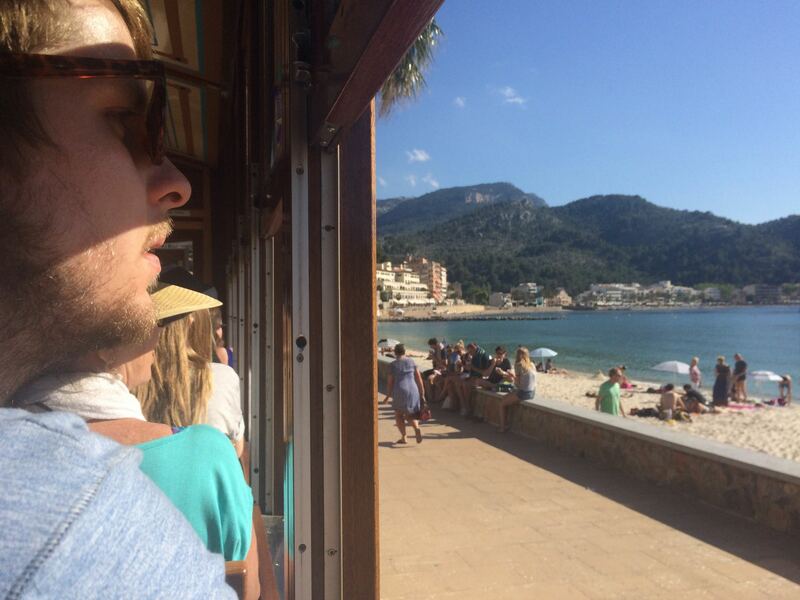 Sa Fonda is a favourite of Virgin Record mogul and local Richard Branson, who has a luxury residence in the town and often brings the stars of his label to the bar. The outdoor seating area sits high above the road, with overhead creepers shading you from the afternoon sun. 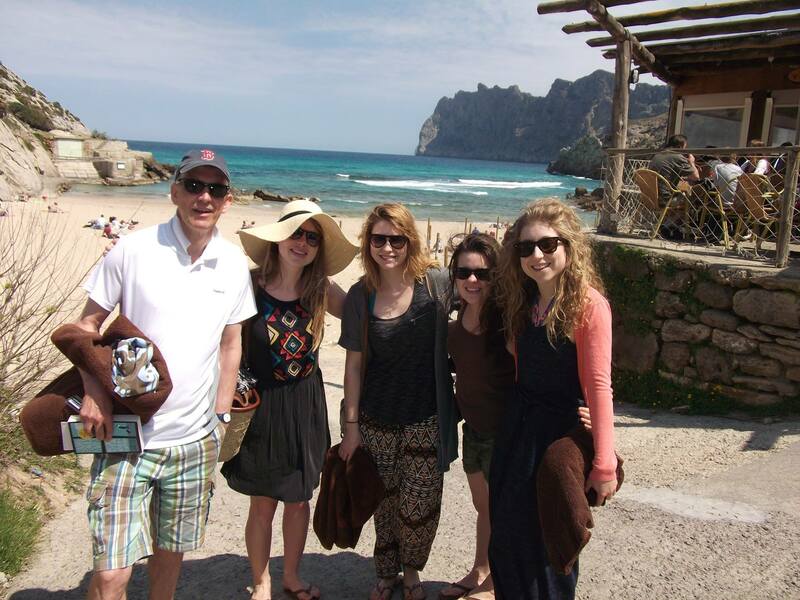 Home to one of our host villas, Puigpunyent is the Whitehead base in Majorca. 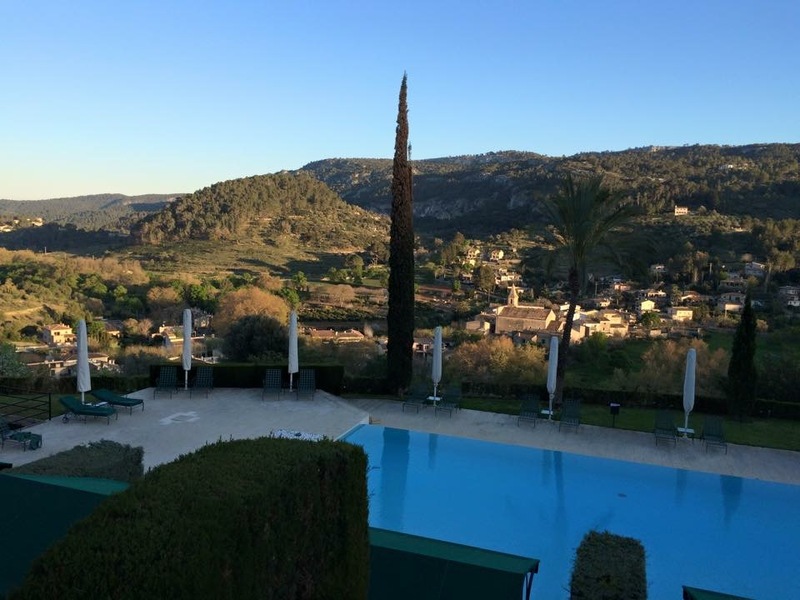 The little village is a 15 minute drive from Palma, and nestles in a valley lush with olive and orange groves, neatly planted vineyards, and framed by the Tramuntana mountains. Its location makes it a favourite for cyclists, and the cafes and restaurants are often packed with brightly coloured lycra-clad bodies. 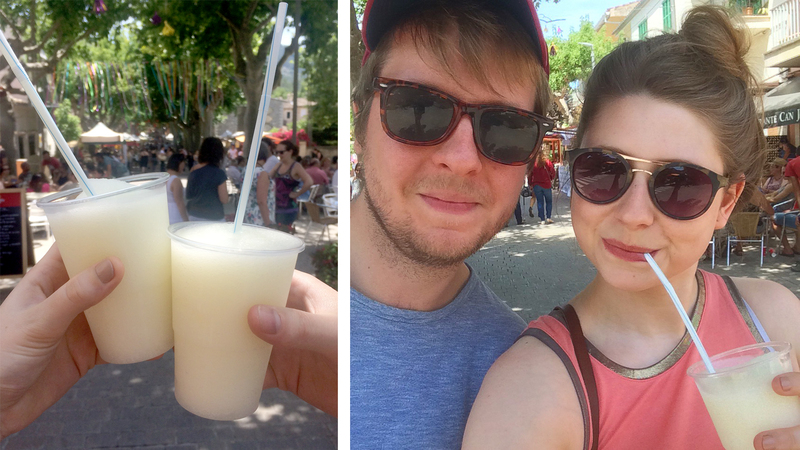 Enjoying fresh frozen lemonade from the Puigpunyent market. 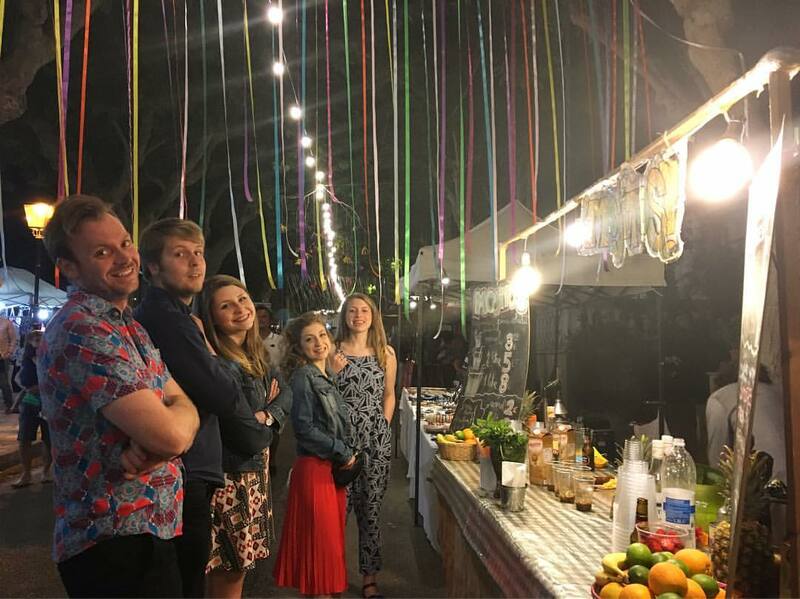 The town square and streets around it play host to many fairs, markets and festivals throughout the year, with stalls selling locally made trinkets and delicious food during the day, and live music at night. 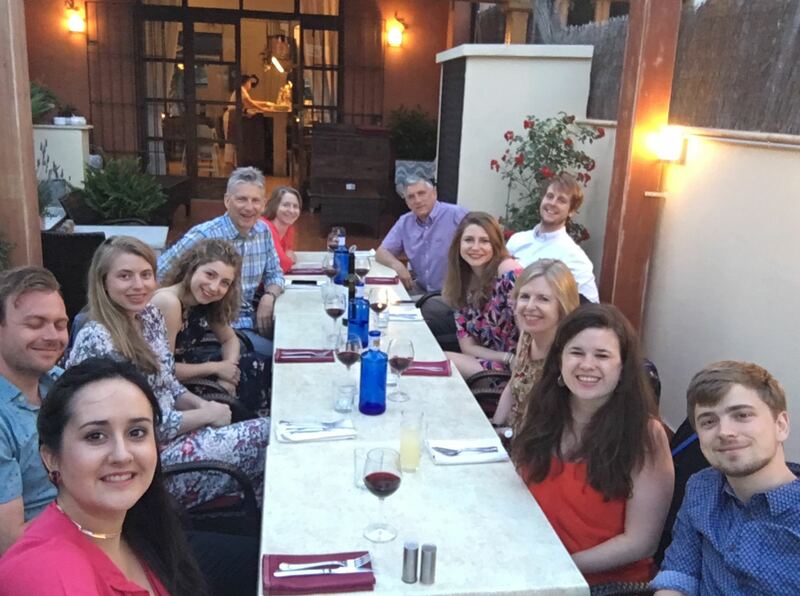 The Rose is our favourite restaurant on the island, serving possibly the best steak you’ll find this side of Argentina. 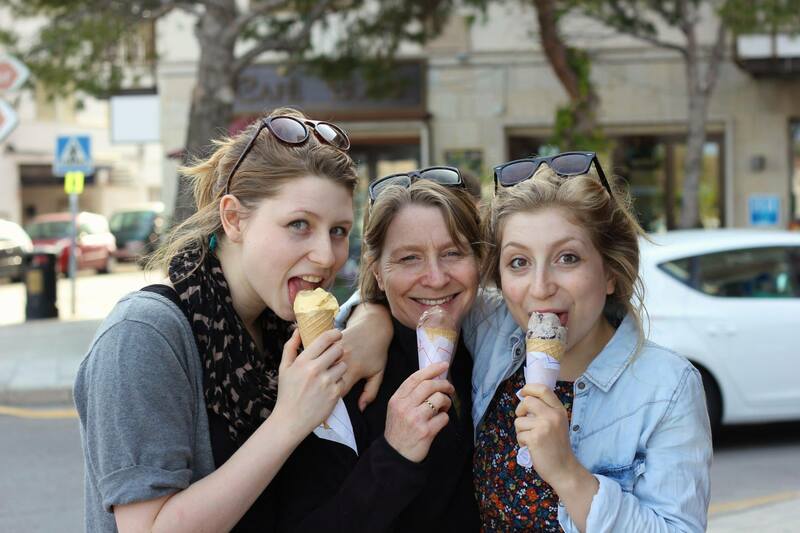 We’ve visited three years in a row and it’s been a highlight of the holiday each time. 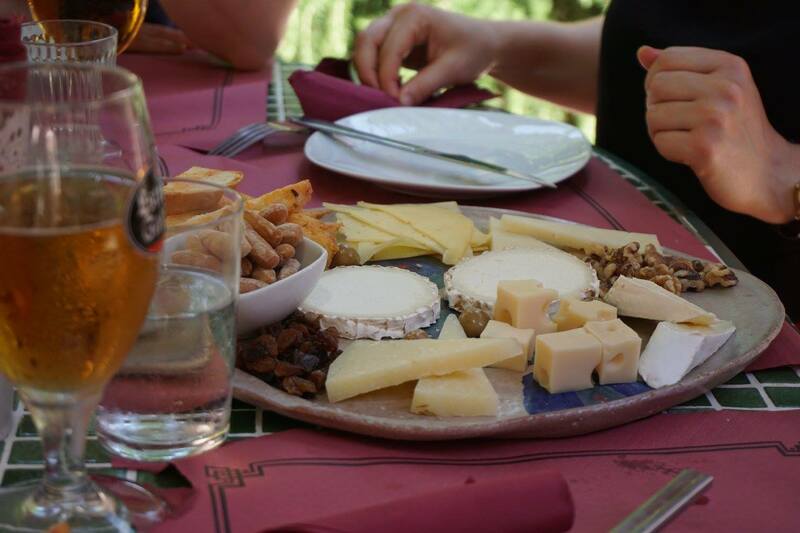 Perfect for lunch or dinner, Ca Sa Nina sets you up with delicious tapas, cold drinks and a sunny terrace to enjoy them on. 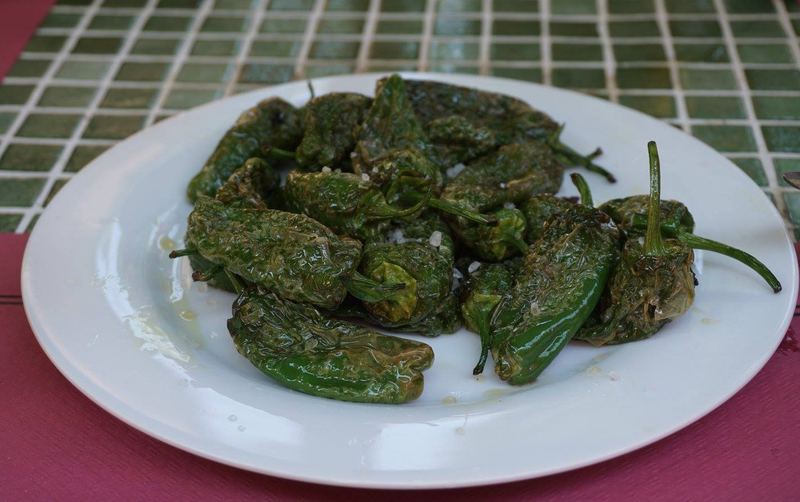 Make sure you don’t leave Majorca without trying pementos de Padrón – small green peppers cooked in oil until the skin crackles and blisters, and generously sprinkled with salt. Supposedly one in ten of these delicious morsels are wildly hot, but every one I’ve tried have been as mild as a bell pepper. 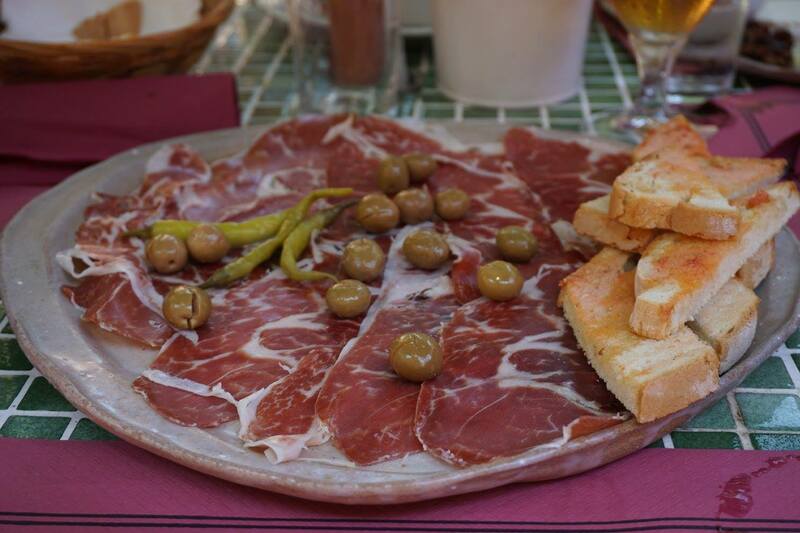 My sister Rosie lived in Galicia for a year – the birthplace of this snack – and she has never eaten a hot padrón pepper, or met anyone who has. I suspect it’s a clever trick to stop the British from enjoying them. The Gran Hotel Son Net is arguably the crowning jewel of Puigpunyent. Converted from a 17th century mansion, this fancy (there’s no getting around the fact that it is very fancy) hotel looks out over the surrounding village and mountains. 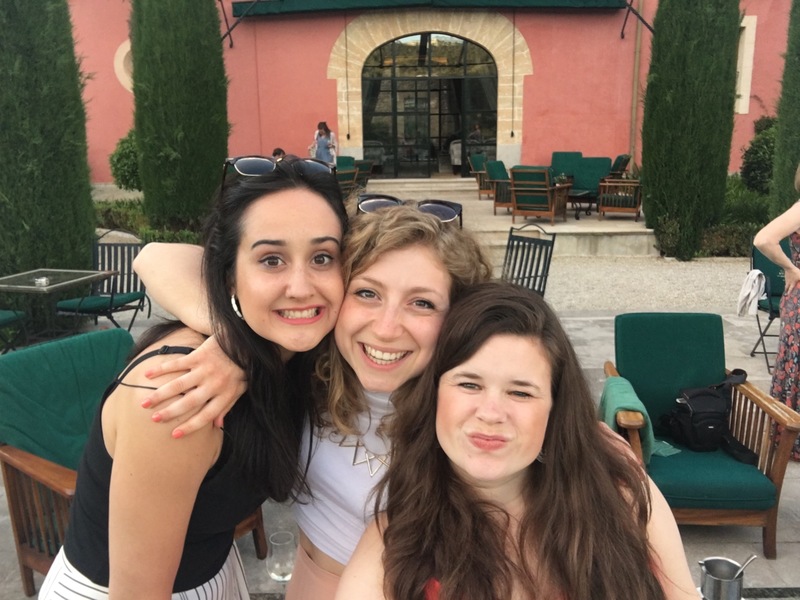 Grab a seat on the extensive patio, enjoy a cocktail or glass of prosecco, gaze out over the infinity pool and treat yourself to a cheeky eavesdrop on the posh guests around you. 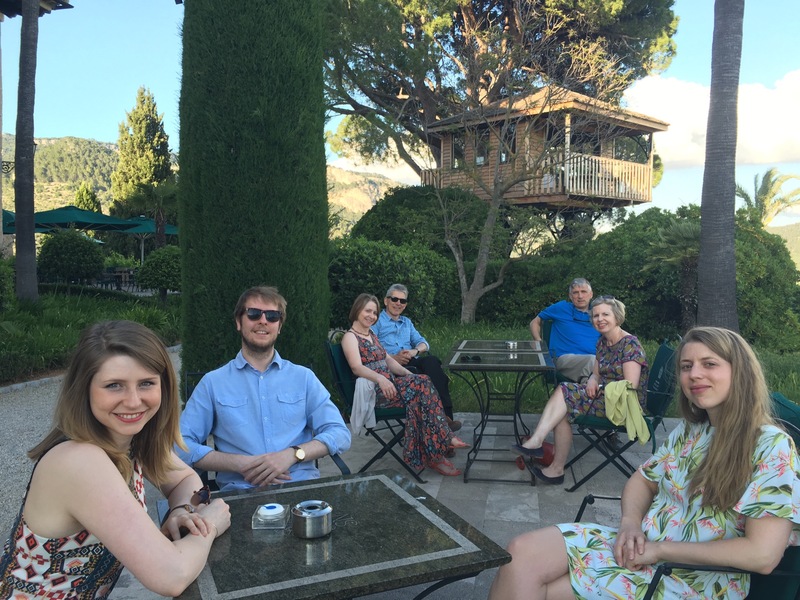 The perfectly preened gardens around the hotel include a large treehouse, which you can hire out for private dinner parties, if you fancy dropping €200 per person. 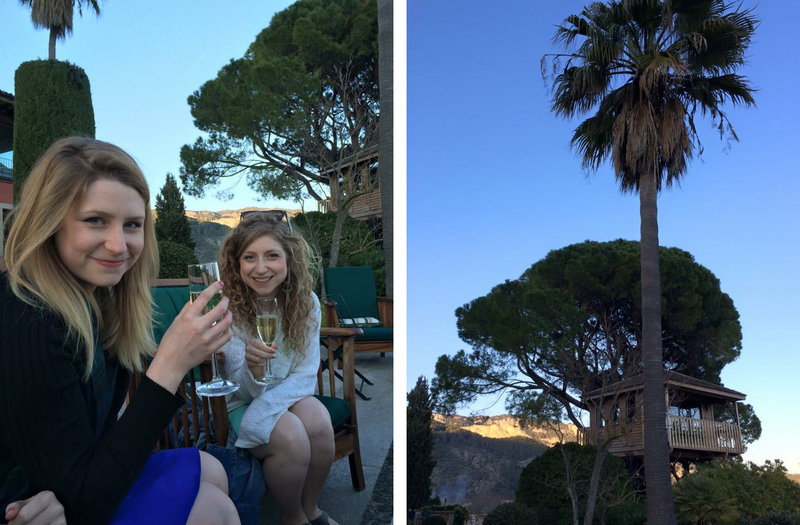 Left: Me and Rosie sipping at some prosecco. Right: The Gran Hotel Son Net treehouse. 370m above sea level, the little village of Galilea balances amongst the hills, attracting tourists for the incredible views over the surrounding landscape. 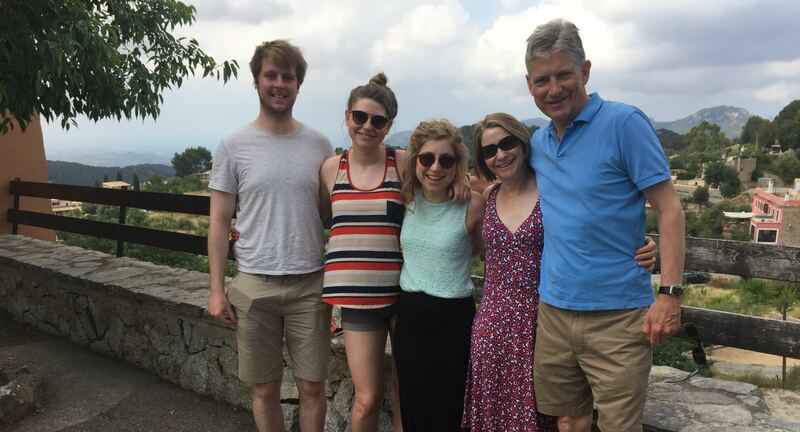 If you want to make a day of it, you can climb along a hiking trail from Puigpunyent, or you can enjoy your holiday like a rational human and just drive. This is the main tourist attraction of the small village – a vantage point in front of the church that on a good day lets you see all the way out to the Mediterranean. 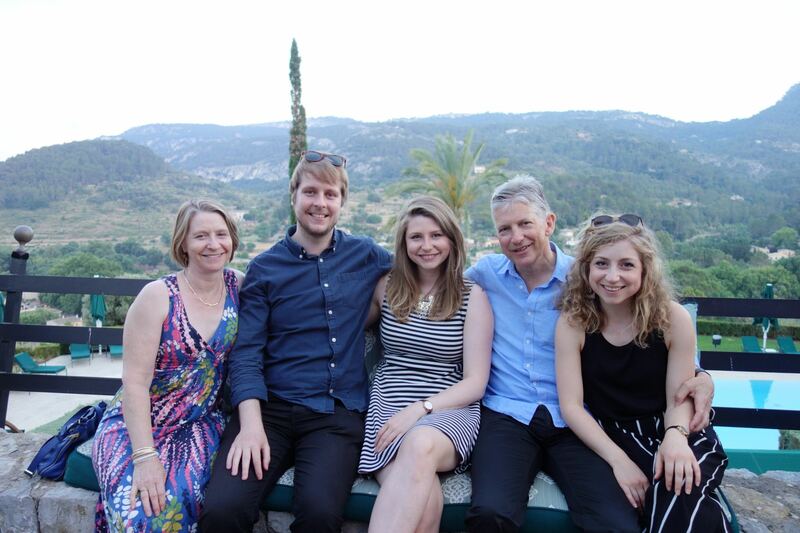 Matt, me, Rosie, mum and dad being photographed by a German whilst he talks about Brexit. Enjoy the view from Galilea more comfortably from the tiny terrace of this little cafe, with coffee to sip and traditional Spanish pastries to nibble on as you gaze over the rolling green hills. 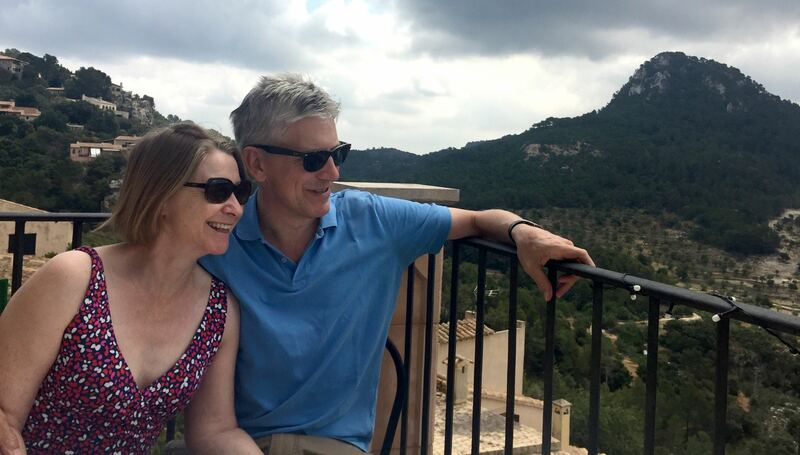 Mum and dad enjoying the view from Cafe Sa Plaça De Galilea. 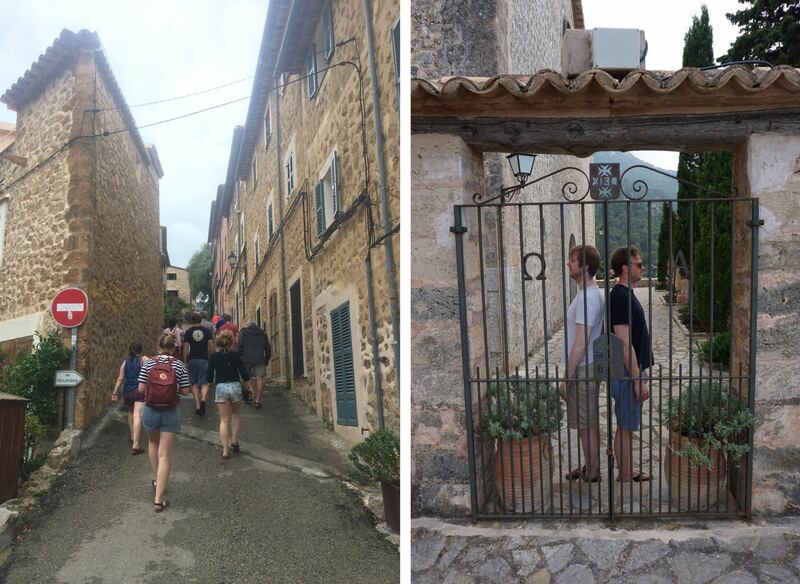 The narrow streets of Pollença, a legacy from the medieval days of the town’s history, are dominated by a large 13th century church and the 365-step stairway that leads to it from the main square. The town has a massive parade every year on Good Friday that reenacts the stations of the cross including a mock crucifixion. Afterwards hundreds of people in cloaks and masks parade the body of Christ through the town by candlelight. Standard. 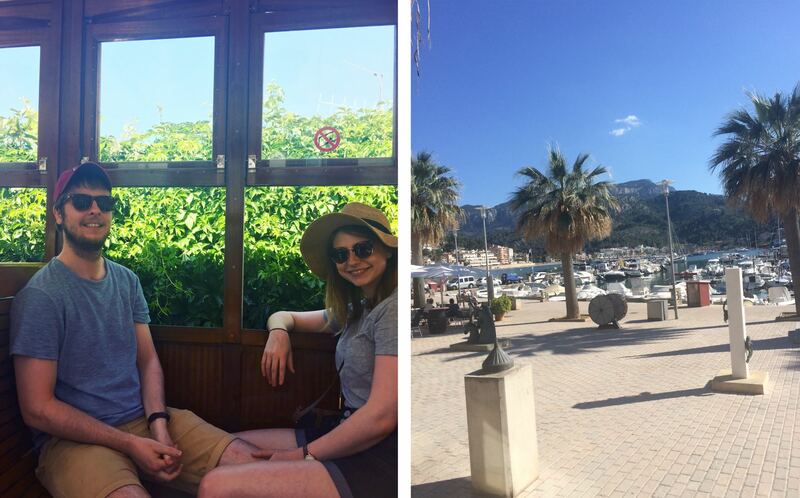 Fun fact: Pollença was founded by the Catalans in the 13th century, 4 miles from the coast in an effort to avoid pirate attacks. 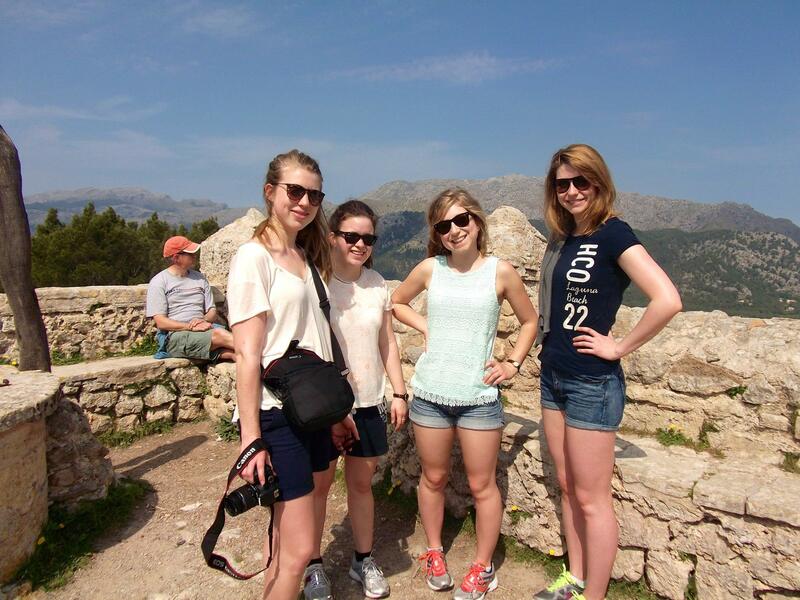 As previously mentioned, if you want to enjoy the splendid views from the highest point of Pollença, you’d better be ready to climb. Don’t rush though, the houses and streets lining the stairway make the journey as picturesque as the destination. 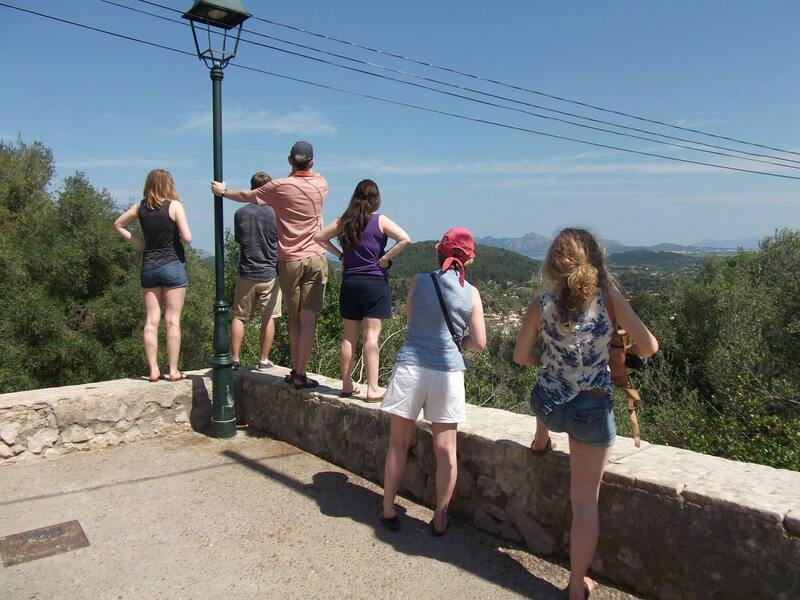 The view over Pollença from the top of the Carrer del Calvari. At the top of the Carrer del Calvari stairs, turn right at the church and follow the Carrer Sense nom to the left to find this incredible lookout point across the green landscape and nearby villages. The view from Carrer Sense nom. 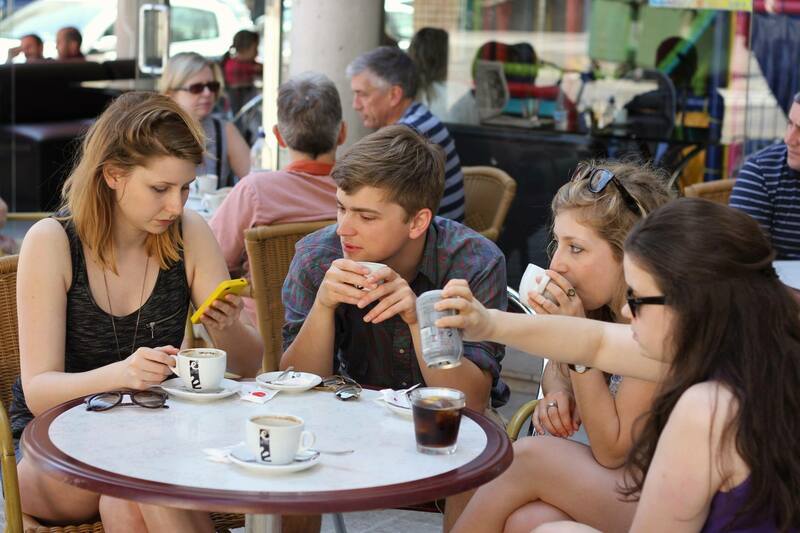 The Brasserie Número Ocho is ideally situated right in the main square of Pollença. Highlights include the wide range of cocktails, the fab service and the truly delicious food. 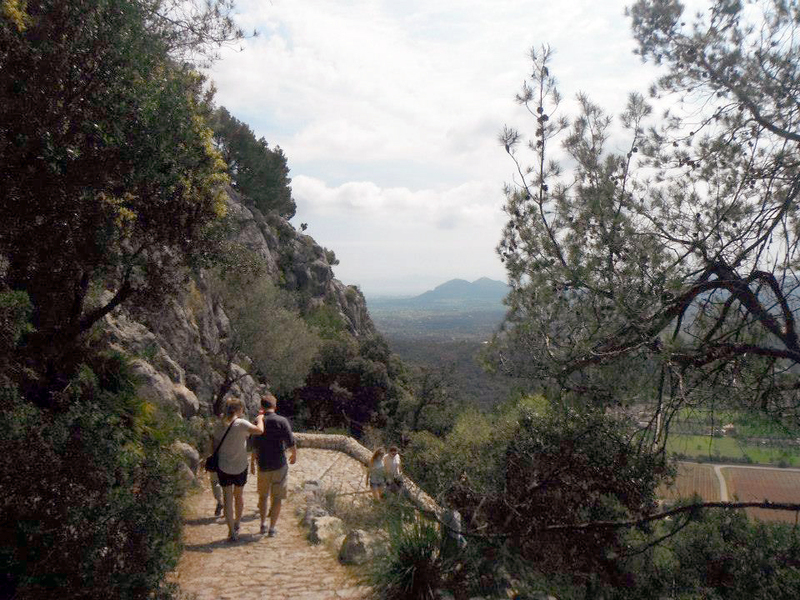 Also known as the Puig de Maria, this 2.2km long trail takes you up to the 330m high summit looking out over Pollença. Feeling like we’ve earned our lunch. 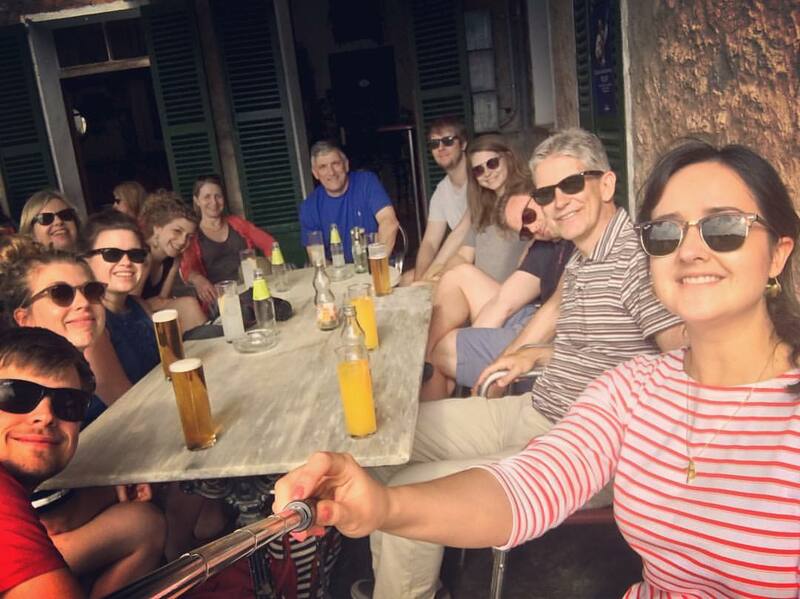 The trail itself is well shaded so the hour long climb is not too taxing, and once you get to the top you can explore the 14th century chapel and monastery, and reward yourself with a cold drink from the cafe. This beautiful beach is nestled in a quiet cove on the south side of the island, but to make the most of it you need to be prepared! There are no shady spots, toilets or convenient places to eat or grab drinks. This means you need to bring parasols, cool boxes of water bottles and packed lunches. A walkway hugs the rocks on the right side of the cove, leading you around the headland to explore hidden caves and admire sweeping views of the Mediterranean. Great if you’ve got some restless boys in your group. 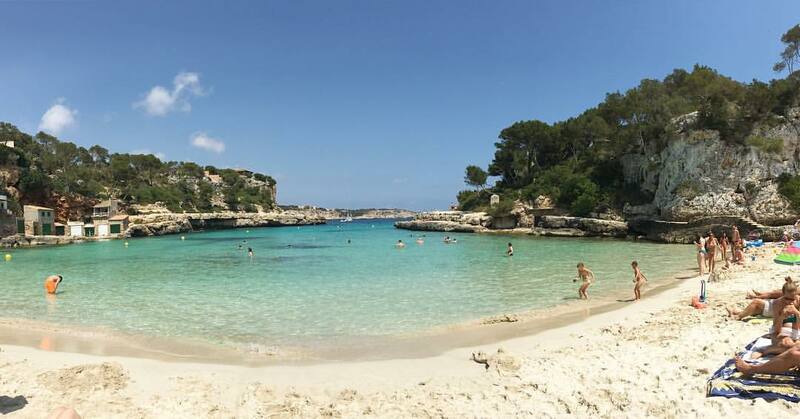 A wide sweeping expanse of white sand that stretches as far as the eye can see, Playa de Es Trench is the favourite Whitehead beach in Majorca. Park along the road to Ses Covetes, carry all your gear along Carrer Covetes, and pick your spot depending on how busy it is and how far you want to walk. Our holidays have always been relatively off season, between April and May, and we’ve never had to fight for space on this massive beach. 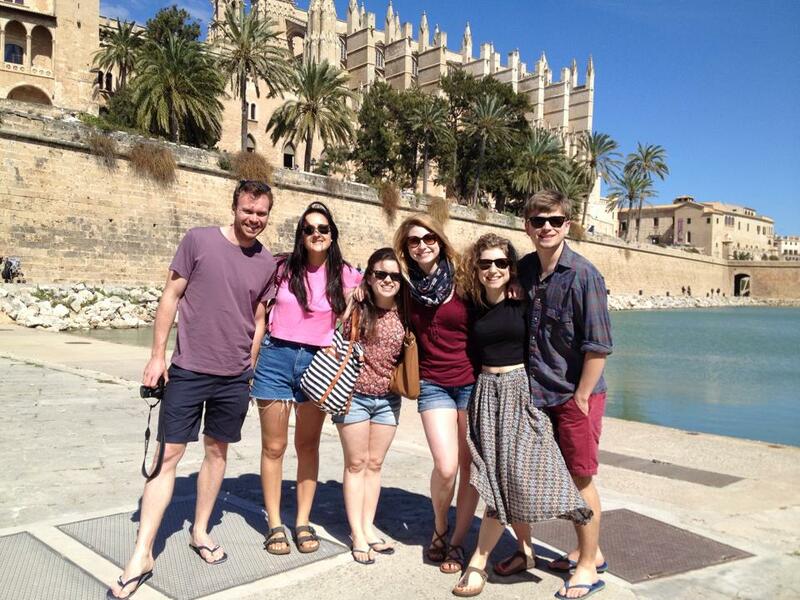 If you need a break from the sun, stroll back along to Bar Esperanza for a cold drink or even for lunch. This cool bar restaurant has been refurbished in the last couple of years, and the modern decor and trendy drinks make it a really pleasant place to chill out and play some cards. Totally candid. 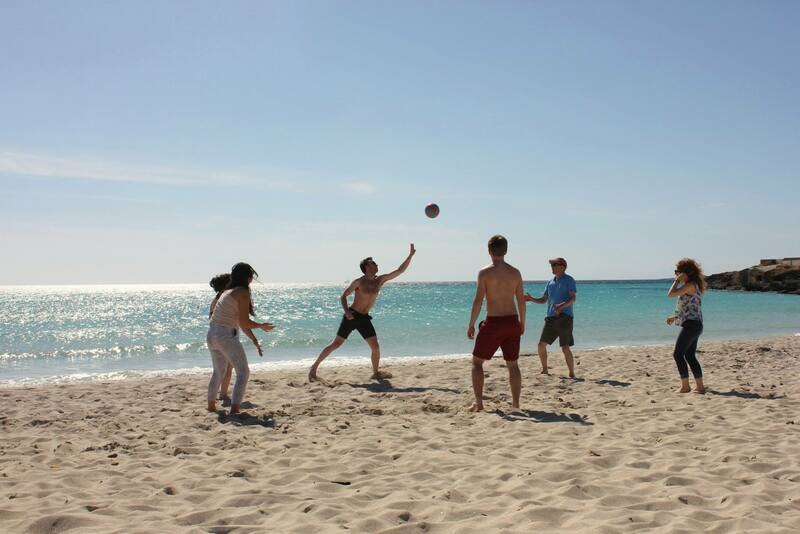 Doesn’t your family do this at the beach? 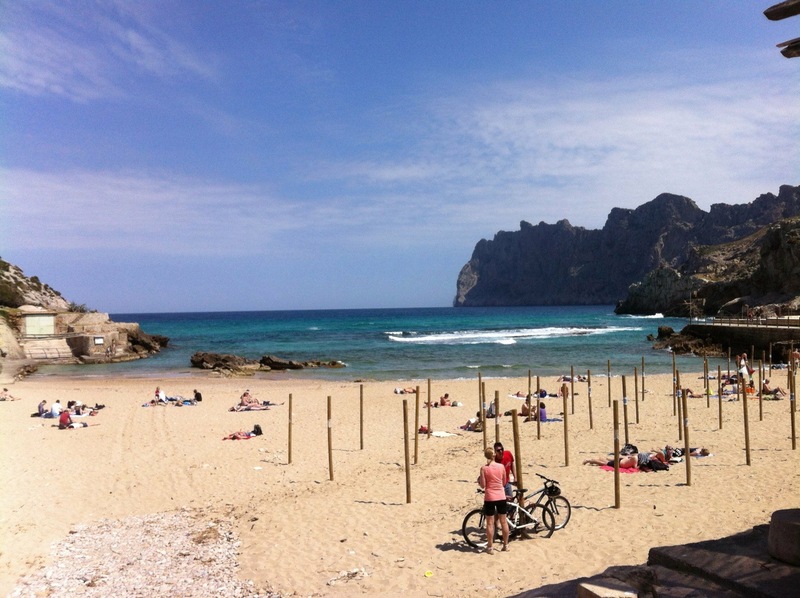 Advertised as the largest sandy beach in south west Majorca, Playa Sant Elm is actually only 130m long. This is because of the terrain of this coast which is mostly rocky. Make sure you get there early, good spots on the sand are in short supply. 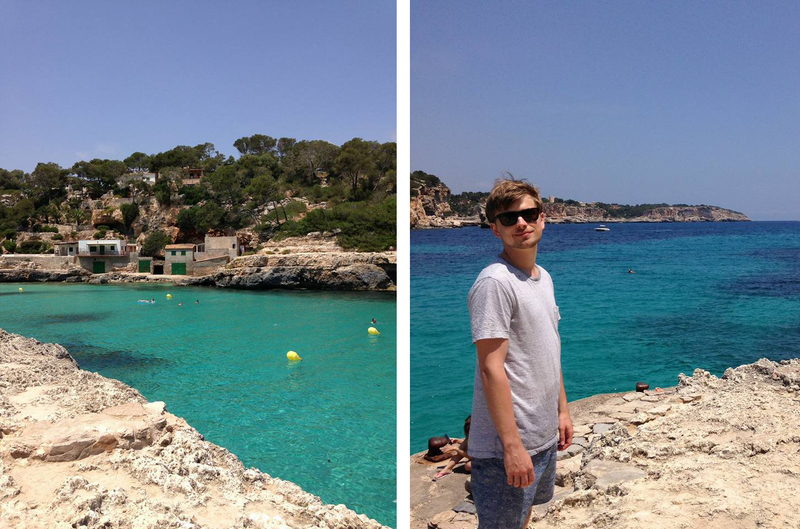 The main benefit of Sant Elm beach is that it has more to offer than just the beach. I personally get bored of sand after a few hours, so Matt and I wandered around the village, bought some cold drinks, climbed the rocks and watched passing boats. You can also hire canoes and take them out to La Illa Pantaleu – the small island just in view on the left. 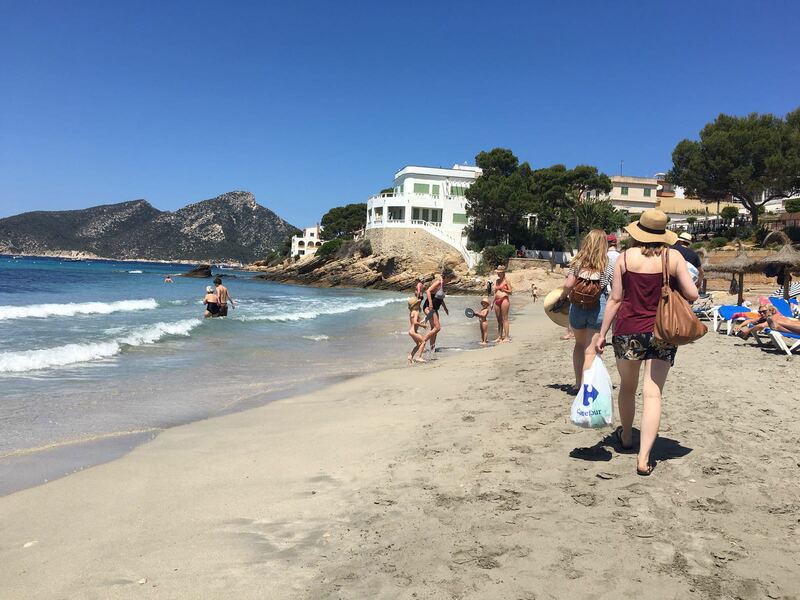 Sant Vincenc actually has four beaches to choose from, with Cala Barques being the biggest, decked out with lifeguard service and snack bar (food and drink availability is a Whitehead priority). 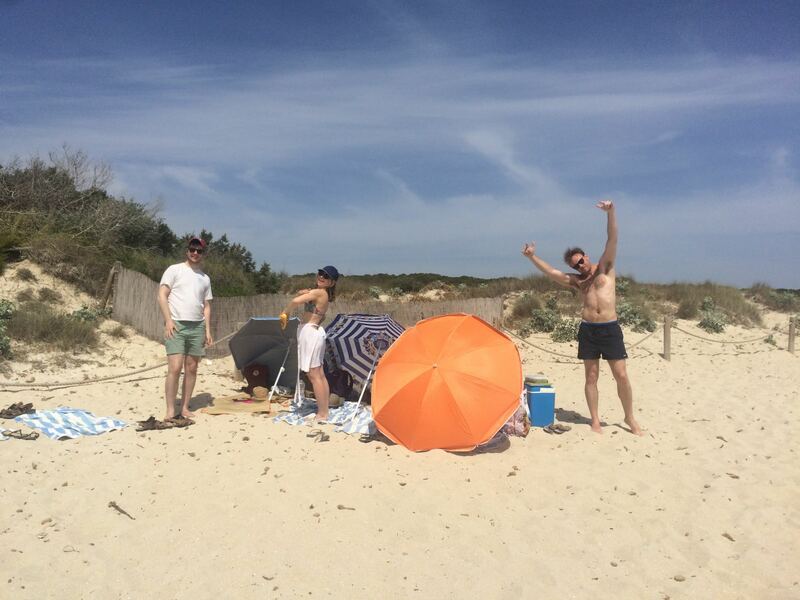 Parasols and loungers are available to hire during peak seasons. 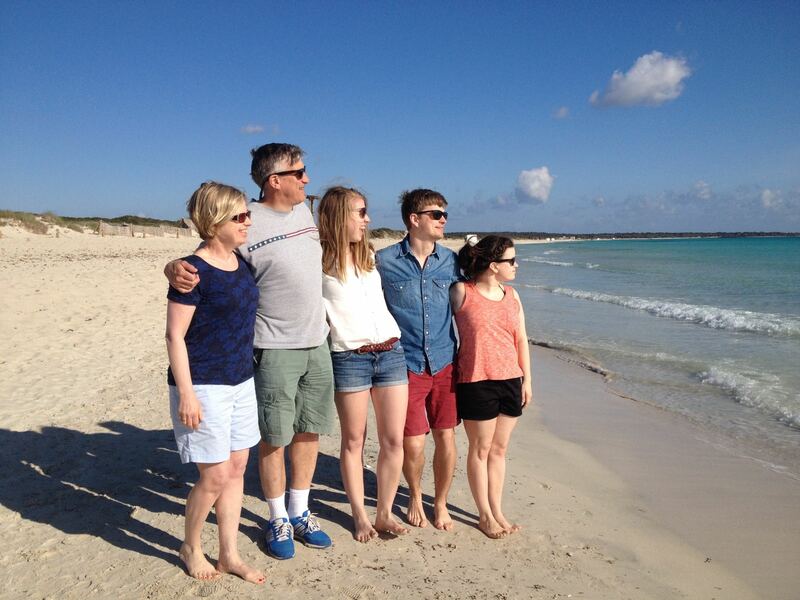 Dad, Laura, myself, Hannah and Rosie, ready to claim our spot on the sand. A remote beach with dramatic rocks and evergreen trees, Playa de Formentor is a long stretch of white sand along the Cap Formentor. It makes for a great cycle destination, apparently (you’ll have to take Rosie’s word for it). 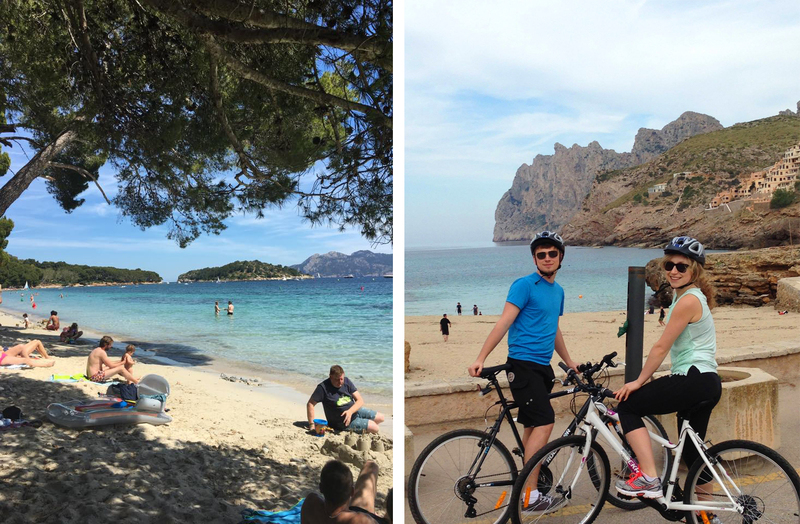 The Port de Pollença has a wide sandy beach curving all the way round Pollença Bay. Rock up for the day to relax on the sand, or go for a walk along the front to watch the boats and explore the shops and restaurants. Laura and Rosie chilling out. Mum sticking firmly to her established shady spot. 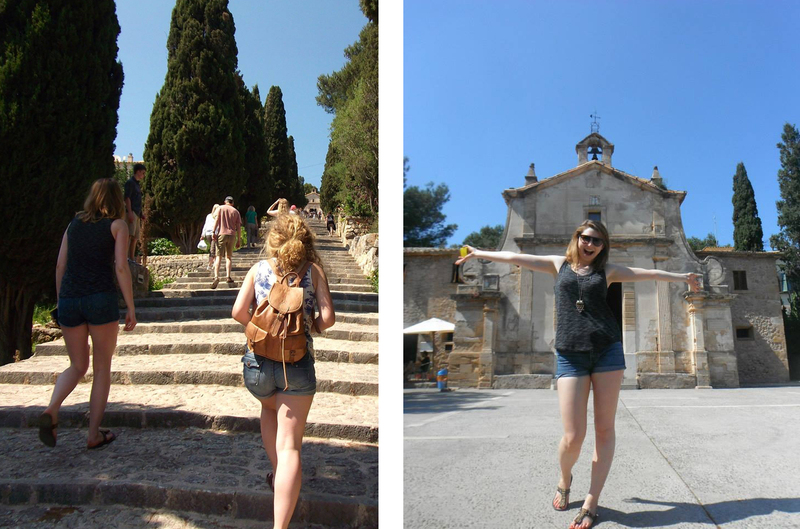 The Whiteheads love Majorca, which you can clearly see from the fact that we’ve returned four years running. If you’re a big group, all you need is a few cars to give people the option to go off and explore all the little towns or relax by the beach. Plus it has good golf courses, but I’m sure that’s just a coincidence. Previous Post Ever stayed in a leisure barn? Such an interesting list! Deffo will give it a try.